Before the start of the course, you will receive your access to XP’s e-learning platform. The online class is a live conference call with the teacher and fellow students, allowing you to learn and interact. The course material is interactive and personalized. You will choose what to study, depending on your interests (Game Design, Art, Code…). You will follow your own pace during the class and will be able to continue by yourself after between classes. In only 6 weeks you’ll have created your first personalized game level. Next, you’ll create an entire game, first in 2D, then in 3D. It’s simple, hands-on and exciting. This course is designed for video game lovers who wish to create their own games and to potentially make it their career. you to strengthen your skills in the domain of your choice, at your own pace. The course uses the popular, free professional software that do not require particularly powerful computers and can therefore be easily accessible from home, to get the most from the course. prepare a solid admission portfolio of your personal creations. This course can also allow a motivated adult to directly join the industry since it offers long term support by professionals. It is recommended to register to 12 courses to understand all the notions. Sorry, this group is full for all dates. Sorry! An error has occurred while trying to process your order. Please try again. You could also contact us at info@studioxp.ca or 1-450-482-1888. The course is based on Unity, a powerful software that simplifies the game development process. It is both an introduction and a complete course that helps those who want to build a portfolio of personal creations, with the support of professionals. Beginners are guided through a simplified version of Unity unique to Studio XP. They obtain results quickly, which pushes them to persevere. Then, students progress step by step by working on projects divided into chapters of 6 classes. This promotes hands-on experience. Chapter 1 – Platforms. Software start-up and basic commands. Basics of level design. Art in 2D with GIMP. Programming visual blocks with Playmaker. Chapter 2 – Puzzles. Music and sounds. Rewards. Programming a trampoline and setting levers. Chapter 5 – Dungeon. Level design of an interior space, camera, lights and animating a trap. Chapter 6 – Boss. Setting a complex fight. Programing quests. Creating a cinematic ending. Just like professional game makers, students save time by using a game canvas and “prefabs” from the Unity Asset Store. They learn to modify them to create their own game. The Main Pathway addresses basic knowledge of all 3 areas of expertise. The first chapters focus on game design and level design. The main pathway can be finished in class without any homework. The Secondary Pathway (Conception, Art and Programming) are unlocked during the main pathway and help deepen the students’ knowledge on one of the 3 expertises. The Advanced Pathway contains more advanced lessons, designed for students who wish who do more and go further into game creation. The course allows students to become autonomous and gain valuable game making experience. During the first classes, beginners will face bugs and technical challenges that are inevitable during the creation process. They learn the advanced functions of a computer, how to use complex softwares, and bug-fixing methods. The course gives a practical experience of the production methods, first with students on their own, then in a team where each one has his own specialty (designer, artist, programmer…). The course is adapted to many type of students: fast and slow learners, young and old, detail-oriented and fast-paced, those with learning difficulties and the gifted. Every student can build his own course. For example, a student interested in art can take more lessons in that field. A student can decide to progressively become specialized in one field or stay versatile. Students can work from home to go further in the course material or to pick up content from a missed class. One group can welcome both beginners and advanced students. A new course begins every 6 classes, for more flexibility. Students can return where they left at, even after months away. There are also summer camps to progress more rapidly. The platform makes communication easy with the teacher and makes it easy for students to follow their own progress. It also allows for a clear overview of the program. Learn to create your own games. 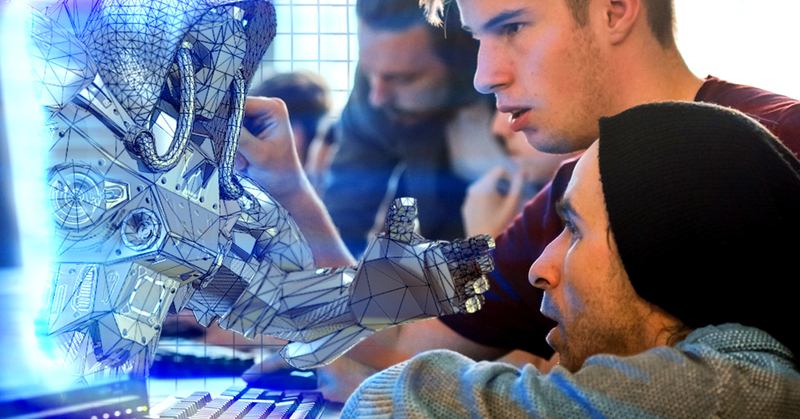 With Unity and Studio XP’s progressive method, it is now easy to turn your ideas into reality, step by step. 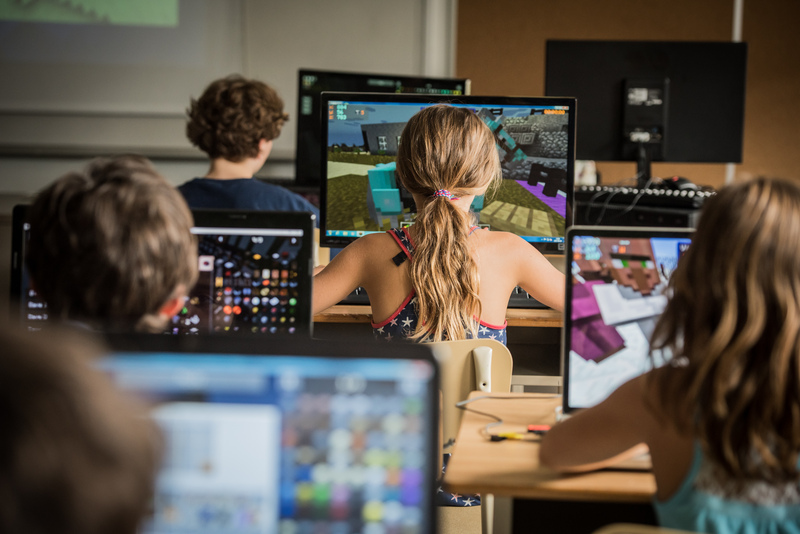 Students gain autonomy by learning techniques used by professionals to create a game they are proud of. An amateur can create quality games on his own and take part in « game jams » (game creation team competitions). Get access to higher studies in video gaming (University…). This course enables students to discover job opportunities and the various education paths. Guided by pros, students are also given the opportunity to build their portfolio which is essential to be admitted in courses with restricted quotas. Succeed in school and in further studies. Gain perseverance, rigor, priority management and the ability to work in teams. Creating a game is also about accomplishing a complex project and assimilating useful notions. Perform in programming courses. Students of Studio XP learn the fundamentals of programming and gain an edge compared to other students, even in higher studies. Going back to studies. Studio XP’s concrete way of teaching gives gives discouraged students their confidence and love of learning back. With dedication and work, the most motivated students can get a job in the industry, even without a diploma. Thriving in a more adapted environment than traditional schooling. Video games attract a wide variety of people. The individualized method of teaching of studio XP is appropriate for the homeschooled and the gifted, for those with ASD, ADHD or SLI, as well as those with internet addiction and who’ve dropped out of school. Furthermore, these courses promote socializing since both the teacher and the students share the same passion. Developing talents at a young age. Same as learning a new language or practicing an instrument, programming, art and knowledge about game mechanics is best learned at a young age when the brain acts like a sponge. Studio XP gives confidence and autonomy to the youth and helps them perform in a world home to constant technological and creative evolution. If absent, a student can access the course at home. However, we do not recommend to miss more than 2 classes within a 6 courses chapter. In some cases, it is possible to take the missed class in another city or take two consecutive classes on the same day (depending on the calendar). The schedule and adresses are available on the website. If you miss a chapter (6 classes), it is possible to retake it during the next session since everyone’s progress is saved on their personal account. Homework is not mandatory. Courses can be completed entirely in class by following the « main courses ». There are usually no classes during school vacations and holidays. A detailed scheduled is available of Moodle. Do you want to become a pro? The game creation course with Unity will help you discover the different careers and make an informed decesion about your studies. It will also allow you to build our portfolio for higher education institutions that require one. By itself, the course can lead to a career path in a small independant studio, given that the efforts are put in. Though, to join a bigger studio (Ubisoft, etc. ), it is recommended to have a specialized higher education degree in gaming or programming. Courses are both for adults and young since everyone progresses at their own speed on a personalized course. their children’s progress on the internet. portfolio and gain practical experience that is difficult to find elsewhere. Special needs or difficulties in school? designed to answer to each student’s individual needs: the teaching approach, content taught, tools, and ways to learn. cinema, architecture, medecine) and involves reading, writing, calculating, creativity, problem solving, organization, collaboration, and perseverance. rich in videos, following a personalized course. Parents have access to the dashboard and follows in real time their child’s progress. They can react better, with the help of the teacher, in case of difficulties. The courses are a place to socialize with students that share the same passion for video games and with teachers from the professional field. The desire to create an interesting game pushes the students to excel and persevere. This course helps the development of students with difficulties in school. covering more content, the work themes of gifted students are synchronized with those of the other students and they can enjoy the group dynamic. the class if the teacher agrees to it. gives freedom which could lead some students to stray on Youtube despite the teacher’s supervision. Students with reading difficulties are helped with videos and short reading texts. However, sofitware contain complex menus that do require reading. steps, encourages them to get organized and persevere. They are surrounded by other students interested in making this their future career. Students who tend be addicted to video games can realize that by becoming a creator instead of a player, they can get some distance with their passion. They socialize in class. The game building process teaches them to be organized. In order to find the time to learn more at home, they must reduce their play time. If you have any particular needs, do not hesitate to contact us. On the first day of class, you will be able to talk with the teacher and decide on an action plan.